This item ships VIA USPS Parcel Select Only. UPS will not take the care required in transporting these collectibles. USPS Parcel Select is not much slower- usps parcels travel 7 days a week, while UPS does not! We do not guarantee absolutely pristine collector grade packaging only brand new item in factory sealed packaging(standard disclaimer). •Predator fans, take note! • Huge 1:4 scale action figures from the movie Predator 2. • 18-inches tall, with over 25 points of articulation! • Interchangeable hands, throwing discs, and weapons unique to each figure. • Get your limited edition Guardian Predator and Unmasked City Hunter! 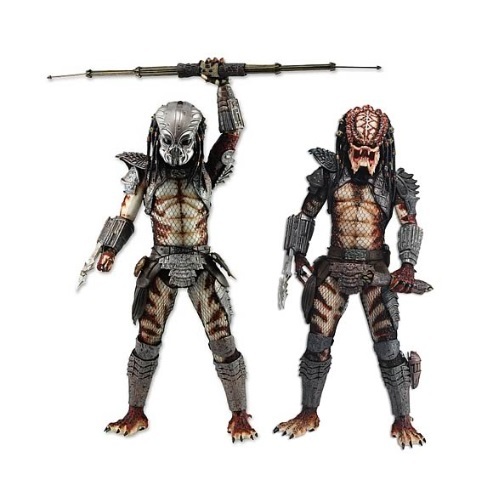 The Predator 2 Series 2 1:4 Scale Action Figure Set includes a Guardian Predator and an Unmasked City Hunter from Predator 2. The netting on these figures is made of real cloth fabric, and their accessories include interchangeable hands and throwing discs. Guardian Predator comes with a telescoping, extending spear weapon, while Unmasked City Hunter includes a collapsed spear weapon. Each figure is a limited edition of 5,000 pieces!